At this point, we know virtually nothing concrete about the future of pet battling when the next World of Warcraft expansion, Legion, goes live. This isn’t concerning at this point, since pets tend to be among the last things to be added in most development cycles we’ve seen since their inception. We can assume a few things based on past experience, though. 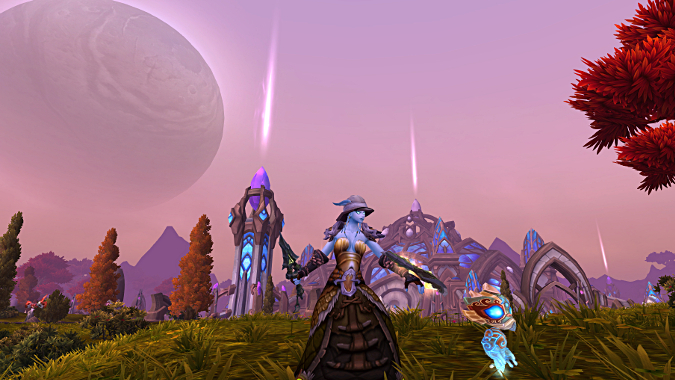 We’ll probably see a few new trainers to battle, like Gargra or Cymre in Draenor. We may get a few new toys (I’m still waiting on Gloria’s Gliding Goodies). New pets are a given as well. We may get ducks at long last, but I’m rooting for a tiny big-eyed version of the moose we saw in the reveal trailer. I’d also guess that because of Suramar’s ties to magic we’ll see new pets in that family, possibly reminiscent of those of the Blood Elves. I’d love to see more animated household-style pets like the broom, for instance. 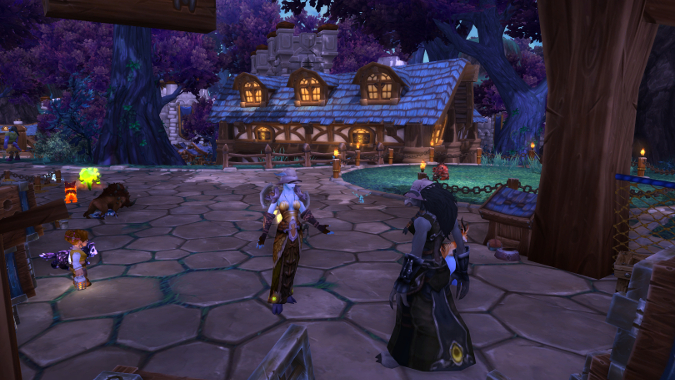 I doubt we’ll be going back to our garrison at all come Legion, but if we get a couple of feather dusters, a mop, some sentient candelabras or dancing plates, I may have to go back and redecorate. So, because we have so little real information to go on, I’ll spend this space discussing what I’d like to see happen for pet battles in Legion. There are a few things that I wish the developers would implement and others I wouldn’t, but there’s one thing I’d love to see happen more than any other. It’s nothing big. A trifle, really. Now, half of you are throwing your Safari Hat at me in indignation, and the others aren’t sure what a Howl Bomb is or why it needs to be destroyed. We’ve discussed it here before, but the gist of the strategy is that, by using the Pandaren Water Spirit and Chrominius battle pets in a specific way, you can effortlessly defeat any encounter we’ve come across that features a single strong enemy. 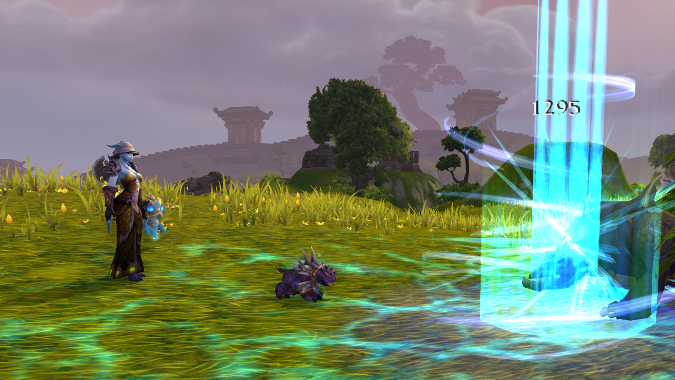 The Pandaren Water Spirit’s Geyser, which stuns, and its Whirlpool, which prevents swapping, erupt in the same turn. Chrominius Howls to double the damage on those two moves, and is then free to use Surge of Power to annihilate the now-stunned, rooted opponent. In virtually every comment section for encounters like this, someone will either ask if it’s viable, dismissively tell you to just use it, or very helpfully describe how. 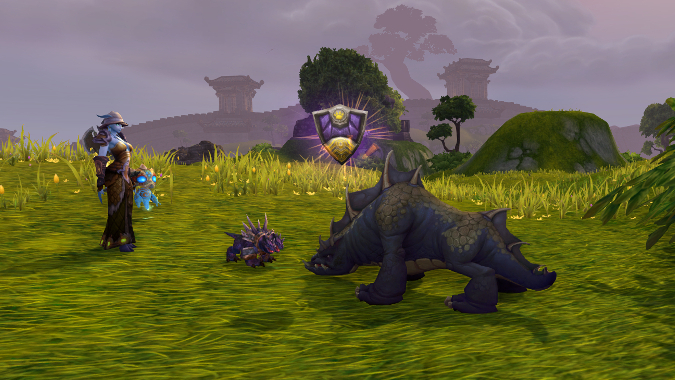 Pet battle play is unlike anything else in WoW. Because the dev team has consistently tried to remove RNG as a factor for success (a good thing! ), PVE pet battling is effectively a puzzle game. A strategy writer can literally prescribe turn by turn which buttons to press in order to defeat an encounter, and it will net anyone a win just as surely as peeking at the last page of the paper will yield the answers to the crossword. This reliance on guides has led to a few specific combos or pets being touted as the only way to win, thereby greatly reducing the confidence some may place in their team. The Anubisath Idol was one of several good choices for several battles in Pandaria, for instance, but was touted as the only pet that would cut the mustard. Similarly, Chrominius is always the assumed second pet for a Howl Bomb, where there are dozens of pets that could also fit the bill. This leads to battles feeling like more of a monumental undertaking than it actually is for beginners. They feel as though if they don’t have Chrominius they may as well throw up their hands and not even try, because they don’t have the single special pet. This is also due in part to the popularity of Twitter in the WoW community. With only 140 characters to spare, it’s far easier to just say ‘Chrominius’ rather than give a long-winded explanation. The specific issue with Howl Bomb is that, in addition to this susceptibility to community-wide trends, it is such a foolproof way to win any single-pet fight that there’s virtually no point in trying a different combination, even for future fights. Most strategies for team battles are tailored to a particular encounter. There are family interactions to consider, moves to absorb or avoid, weather synergies, etc. However, with Howl Bomb there are precious few battles that can’t be defeated just by going through those motions cold, and in those few cases the prescription is usually to wait a turn or two before starting. This also renders any new encounter absolutely trivial before it’s even implemented. Why even try a dynamic solution that considers the fight when you can just Howl Bomb it? The easiest way to bring Howl Bomb down to size a bit would be to move abilities around on the Pandaren Water Spirit so that either Geyser and Whirlpool can’t both be selected in a single fight. The better route would likely be to nerf the Shattered Defenses ability across the board, to maybe a 50% damage boost rather than 100%. It would still reward people for stacking debuffs and coming up with good combos, but avoid another de facto universal solution involving, say, the Zandalari Kneebiter. An alternate route would be a buff similar to the current Boss buffs on these encounters, only instead of having a damage cap per hit, make the cap per turn. Players could still use Howl Bomb in the fights they’re already used to, but also have to think critically in future fights. The bottom line is, because pet battlers will continue to share strategies, much of the challenge is gone unless you seek it out anyway. It’s a bit of a double-edged sword, because the pet community is a kind, welcoming place eager to help, so there will always be an issue of certain strategies being the de facto rule. I would contend though, that having to alter strategies from fight to fight makes the mini game more robust and the community as a whole healthier. Even if people are looking up strategies, with different solutions they have to continue to participate, where now, after the first time a new battler sees a Howl Bomb, they never have to come back. While many would contend a one strat fits all solution is exactly what they want out of battling, it severely cuts down on how sticky the mini game is, and thereby perhaps how popular it is long-term. There’s no room for engagement with ‘just Howl Bomb’, even for battlers who are passionate about it. ‘Just Howl Bomb’ undermines virtually all discussion on the topic. So, I’m hoping the devs break Howl Bomb in Legion. Maybe just a little bit. Also, maybe they’ll add breeding or mobile battling or something. The fel-tainted sky is the limit.